The Welsh Hawking Centre is a family run business. I'd like to introduce you to my family. The Welsh Hawking Centre is a family run business founded in 1980 by the late Ceri John Griffiths or "Griff" to everyone who knew him. Griff purchased the old Cardiff Zoo in 1980 with the intention of converting the zoo into a hawking centre, the first in Wales. As an ex-teacher education was of primary importance followed closely by breeding Birds of Prey, something in its infancy at the time. 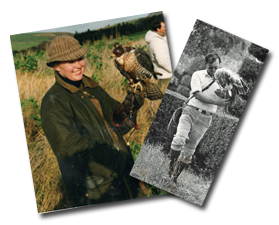 I myself, Norma Griffiths came to the Hawking Centre in 1985 and now run the Centre alongside my sons Jamie & Griff, who gave up careers in Wildlife Management in Africa and Equestrianism respectively, in order that the Centre continue after Griffs untimely death.